Parthenope was one of the Sirens in Greek mythology. She is the mythical founder of Naples. These beautiful, supernatural sea nymphs, born of the primordial sea, inhabit the ocean waters along the western coast of the Italic peninsula, and were the subject of many of the legends and myths of Old World Sud Italia and ancient Greece. The sirens are goddesses of nature, specifically of the sea and oceans. The colonizing Greeks saw them as living in a flowery meadow, wildly unpredictable, dangerously seductive creatures that lured sailors to their deaths with their enchanting songs. The indigenous Italic peoples perceived the sirens a bit differently. The etymology of the Italian words sirena, sírena, siréna, sirena and sirenas all refer to mermaid and also to sounding the alarm. In the indigenous Sud Italic landscape, the sirens are the gatekeepers; they are our beloved and beneficient goddess/mermaid protectors who live in and sing enchanting songs from the sea. Our ancient stories say that a centaur named Vesuvio was in love with Parthenope. Jupiter became jealous over this and in his anger turned the centaur into a stratovolcano and Parthenope into the city of Naples. Vesuvio’s love and passion were thwarted and his rage over having his love denied is manifested in the volcano's frequent violent eruptions. One of the most archaic views of the sirens is that they are soul-birds and represented the souls of the dead. This links them to the Egyptian Ba, a human headed bird who symbolized the human soul. Indeed, Parthenope was referred to as “the bird goddess” by Lycophron of Alexandria, a poet of the 3rd century BC. This tells us that the sirens’ roots extend all the way back to the Paleolithic and to our original, most ancient mother goddess. The Bird Goddess represents nourishment and the cycle of birth/death/rebirth. Naples has a long history of birth/death/rebirth and we are going to be exploring all of it on this journey. The Lungomare near Castel dell'Ovo is called Via Parthenope and our ancient stories say the castle itself was built directly atop her tomb. Naples is beautiful, emotional, passionate, wild hearted to the max, untameable. Naples is ancient, exciting, tragic and inspirational all at the same time. Parthenope's vulnerability gave her infamy. The legends say that she gave herself wholeheartedly to love, and though her love and desire was not reciprocated, her song and her story is woven deeply into the warp and weft of the city that is Naples and the country that is Sud Italia. If you listen deeply, you will hear it. Join us in the classic, historic and exhilarating city of Naples and its surroundings, May 4 –10, 2020! Most of our immigrant ancestors from Sud Italia, booked passage to America on ships embarking from Naples. We, their descendants, are booking passage back again…to our origins, to our roots, to our ancestral lineage, to the wisdom that has sustained a proud, beautiful and accomplished people for millennia. Rediscover lost cultural threads, reweave them back into the fabric of your modern, daily life, welcome new ancestral connections and allow them to inform your work and restore your spirit. 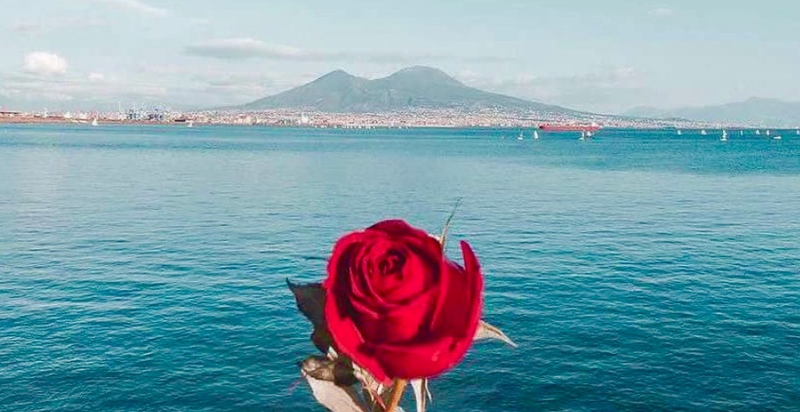 We’ll spend a week together exploring the wild heart of Parthenope/Naples with her beyond-amazing collection of ancient history, legends, magic, old world art and culture. We’ll be in the company of amazingly generous, savvy, loving and beautiful people and will feast on some of the freshest and most fabulously delicious traditional foods in this world - impeccably prepared ocean-fresh seafoods, garden fresh fruits and vegetables…olives, eggplant…mozzerella, salciccia…Napoletan traditional pasta dishes, the best pizza in the world! We’ll be diving deep into Napoletan culture, interacting with Napoletan people, singing Napoletan songs…we’ll learn a few traditional Napoletan prayers, go to some churches, light candles, make offerings, make plant healing magic, eat fabulously well and fall in love with timeless, exotic, awe-inspiring Naples and her salt-of-the earth people. We’re offering this journey as a cultural immersion trip; we’ll be seeing and experiencing some of the most remarkable and world renowned Old World art, archaeological and cultural sites on earth, be surrounded with classic and beautiful architecture and roam through unrivaled botanical and ethnobotanical collections. We’ll be stepping into ancient history with one foot and into the real life timeless soul of the city that is Naples with the other! Join us for what will prove to be a most memorable, enjoyable and inspirational journey into the wild heart of Parthenope! 7 days…$3,489…includes housing, breakfast and dinners, transportation to all sites and all entrance fees. Does not include your airfare. We’ll pick you up at the Naples International airport at a pre-arranged time for a ride to our comfortable, well situated apartment in Naples. Or, if you prefer, we will give you directions to our housing and you can arrive on your own schedule. Our Sud Italia excursions are limited to 5-7 people at a time! You may place your $500 non-refundable deposit now to hold a space in this journey using the button at the top of the page. The remainder of your payment, $2989, is due by March 31, 2020. We prefer you send us a check made out to Gail Faith Edwards for that amount. Using a credit card or Paypal to make the final payment incurs an additional $50 to cover bank and website processing fees..
Day 1 – May 4 - The Botanical Gardens and Ethnobotanical Museum - Naples Botanical Garden is one of the most prominent botanical gardens in all of Europe, noted both for the relevance of its collections and the number of species in culture. It hosts one of the largest and most biodiverse collections in Italy, with approximately 25,000 samples, covering about 10,000 plant, shrub and tree species, representing almost all floras from the different regions of the world. kept in the open or in controlled environments. The Garden is actively engaged in the preservation of endangered plants and hosts the Museum of Paleobotany and Ethnobotany, the Herbarium, a botanical library and a seed bank. The greenhouses (warm, temperate and cold) cover approx. 5000 sq. meters. Among the most important collections are the cycad collection, the collection of succulents from the African, American, Asian and Australian deserts; the tree fern collection, one of the few in Europe; the palms; the Italian orchids and the bulbs; the air plant collection and the Citrus grove. The paleobotanical section of the Museum illustrates the evolution of land plants, with the help of fossils, reconstructions and texts, starting from the earliest vascular plants to the present. The ethnobotanical section illustrates the various uses of plants, displaying objects, products, pictures and plant specimens; special attention is given to daily activities and interaction with plants of several disappearing ethnical groups. We’ll bring a picnic lunch and spend a good part of a day here, there is so much to see, learn and discover, and it such such a magnificently beautiful place. Day 2 – May 5 - Pharmacy of the Incurabili - The First Pharmacy in all of Europe - This is a most interesting place combining the workings of science, art, medicine, magic, alchemy, spirituality, education, history and culture! It is a still working hospital, a historical pharmacy, a church, a cloister and a library all together in one complex. The Pharmacy is part of the convent of Santa Chiara degli Incurabili, founded in the early 1500s by Maria Lorenza Longo, a Catalan noble woman who dedicated herself to helping the poor and sick during the years that Napoli was struck by the plague and other infectious diseases. The walls of the pharmacy are covered by six-tier walnut cabinets and the floors are tiled in majolica and terracotta. Every section has shelves containing polychrome vases (dated 1747-48) portraying biblical scenes. The vases contain perfectly preserved ointments, syrups and powder. The Pharmacy ceiling is decorated with the fresco by Pietro Bardellino depicting scenes from the Trojan War. The Pharmacy contains remnants of ancient healing mysteries in its architecture, such as hidden figures and symbols in marble and magical decorations on doors, archways and columns. Inside the courtyard of the hospital, opposite the Pharmacy, there is the Museum of the history of Medicine and Health, which documents the development and discoveries of medicine throughout the centuries. This timeline underscores the advancements in the practice of medicine in Naples during the 16th century, compared to the rest of the world. The museum houses many rare surgical instruments and artifacts, such as a portable pharmacy from the 18th century, the first glass feeding bottles and primitive face masks, including the masks used by the plague doctors. Day 3 - May 6 - The Cave of the Sybil on the Bay of Polluzzi - The Antro della Sibilla is part of the Cumae Archaeological Site (Parco Archeologico di Cuma). “The gates of hell are open night and day; Smooth the descent, and easy is the way: But to return, and view the cheerful skies, In this the task and mighty labor lies…“ Virgil described the cave with a hundred openings as home to one of the most famous prophetesses of ancient legend - the Cumaean Sibyl. Written in 19 BC, the Aeneid chronicles the adventures of Trojan warrior Aeneas, including his encounter with a mysterious ancient oracle. It was said this oracle, or sibyl, dwelt in the mouth of a cave in Cumae, the ancient Greek settlement near what is now Naples. “A spacious cave, within its farmost part, Was hew’d and fashion’d by laborious art Thro’ the hill’s hollow sides: before the place, A hundred doors a hundred entries grace; As many voices issue, and the sound of Sybil’s words as many times rebound.” In the poem, the Sibyl acts as a guide to the underworld, to which Aeneas must descend to seek the advice of his dead father Anchises and fulfill his destiny, the eventual founding of Rome. The Cumaean Sibyl appeared in the works of Ovid, is painted on the ceiling of the Sistine Chapel by Michelangelo, is written about in Dante’s Inferno, and in the poetry of TS Elliott. According to tradition she sang her prophecies in verse, or wrote them on oak leaves which she left at the mouth of the cave. The Sibyl’s cave is very close to other famous Roman caves which lead to Lake Avernus, including the Crypta Romana and the enormous Grotta di Cocceio, a tunnel dug through the mountain to access the Lake, which is large enough for chariots to pass through. All of these portals into other realms have reinforced the long-held associations of Southern Italy with the mythical underworld. The volcanically active region around Naples is known as the Campi Flegrei, or “Feiry Fields.” Avernus was named as the opening to Hades by Virgil, and the area’s bubbling sulphur pits and volcanic, brimstone-scented islands were also mentioned by early writers as portals to hell. We will enter into this ancient, still-vibrant portal, listen for the Sybil’s voice, and perhaps hear her guidance, inside the innermost chamber of her cave, where it is believed she received and wrote her prophesies. And, will probably soak in a hot bubbling healing ocean vent while in the area and visit the Underwater City of Baia. The Underwater City of Baia Archeological Park - A prominent resort city for centuries, Baia catered to the recreational whims of the rich and powerful among the Roman elite. The city, located over natural volcanic vents, was famous for its healing medicinal hot springs which occurred all around the city and were quite easy to build spas over. Some of antiquity’s most powerful figures such as Nero, Cicero, and Caesar were known to have visited the city and a number of them actually built permanent vacation villas there. Unfortunately, the good times were not to last and the city was sacked by Saracens in the 8th century. By 1500, the remains of the formerly luxurious town were abandoned. After the city remains were emptied, the water level slowly rose, and most of the ancient ruins were drowned under the shallow waters of the bay. We'll visit the ancient remains of Baia in one of the world’s few underwater archeological parks through glass-bottomed boats. Day 4 – May 7 - The National Archaeological Museum is one of the most important museums in the world due to the uniqueness of its heritage and the immeasurable contribution it has made to European culture. It holds the world’s most famous collection of Old World art and artifacts…everything removed from Pompei is here! The amazing “many-breasted” Artemis is here! (They aren’t breasts, they’re bee hives!) All the most famous paintings and ceramics regarding the Greek myths are here! All the bigger than life statues of the Gods and Goddesses are here! And so much more ancient, Old World beauty such as the artifacts excavated from sites in Campania and throughout Southern Italy, in places such as my valley, and also from private collections. The Cimitero della Fontanelle - The Fontanelle cemetery in Naples is an ossuary, located in a cave in the tuff hillside in the Materdei section of the city. It is associated with a chapter in the Catholic folklore of the city. The cave is the unofficial final resting place for the indigent of the city —a vast paupers' cemetery. A spontaneous cult of devotion to the remains of these unnamed dead developed in Naples. Devotees paid visits to the skulls, cleaned them—"adopted" them, in a way, even giving the skulls back their "living" names (revealed to their caretakers in dreams). An entire cult sprang up, devoted to caring for the skulls, talking to them, asking for favors, bringing them flowers, etc. A small church, Maria Santissima del Carmine, was built at the entrance. The Napoletani women still pray to and leave offerings for the skulls, though they’ve been admonished to stop, believing that to stop now would be to abandon those souls they’ve lovingly adopted and cared for over generations. It's quite an interesting place! Day 5 – May 8 - The Museo di Capodimonte is one of the most prestigious museums in Italy. Located in the grand Bourbon Palace of Capodimonte, it was used by the kings of the Two Sicilies as their summer residence and hunting lodge. It’s the major repository of Neapolitan painting and decorative art and is a most exquisite, inspiring place. It’s located in a hill overlooking the gulf of Napoli and the woodland is vast and extremely well kept. The painting collection covers almost all periods, starting from the Giotto school up to contemporary Andy Warhol and Italian-Greek Jannis Kounnelis. We will see works by Caravaggio, Tiziano, Botticelli, Bellini, and Brueghel, as well as Parmigianino and Correggio, the “Crucifixion” by Masaccio, and “The Mystic Marriage of St. Catherine” by Carracci, as well as original drawings by Michelangelo, and art by El Greco, Titian, and many more. We’ll walk through the old apartments to see the 18th-century furniture and the truly remarkable and outstanding collection of royal porcelain and majolica. We’ll bring a picnic lunch, take our time strolling through the collections, explore the beautifully maintained royal grounds and make a day of it. The views of the Bay of Napoli on the way home will be exquisite! Day 6 – May 9 - Paestum – On the edge of the Sele plain, where the Cilento National Park begins, sits Paestum, one of the most precious archaeological jewels in Italy’s crown, famous throughout the world for its well preserved spectacular Doric temples. According to legend it was founded by the Argonauts, but in reality it was established around the year 600 B.C. by the Greeks of Sybaris, who called it Poseidon. We’ll spend a full day here at this ancient site also once inhabited by the Samnite and Lucanian tribes. The via Sacra takes you across the beautiful, softly rolling, well kept grounds where you'll see ruins of residences, still with the original tiles in the floors, marketplace, cultural activities, forum, and of course, the huge, imposing, magnificent temples...Hera’s temple is here, Minerva’s is too. We’ll do ceremony, enjoy lunch in one of my favorite little places, peruse the museum full of treasures from Paestum, get the best gelato Ive found yet and also pay a visit to the shrine of one of our Seven Sacred Sisters of the Cilento, the Madonna of the Granato. Day 7 May 10 – That’s it, you’re heading back home today. You’ll be packing up incredible memories, huge shifts in perspective, life altering insights, and perhaps even a deeper appreciation for your own life and ancestral lineage and connection.